Wednesday’s panel discussion on the Evolution of Hydromet and Climate Services emphasized the need for the health and climate communities to work together more closely. In this context, Kris Ebi of the IPCC made a direct request to federal agencies and journal editors about papers involving multiple disciplines. Listen to the clip here. Are we going to see a “fair and balanced” view of so-called “global warming” aka “climate change” come out of these meetings. Even if one side is completely wrong … in the spirit of scientific inquiry — the issues should be out on the table in full view. If NOT, then this whole process — and your meetings on GW/CC — are a sham!! This seems to be a good opportunity to point out that people who did not attend the meeting can now go well beyond the abstracts and see for themselves the range of information exchanged at the meeting in oral presentations (if not the interesting discussions that took place at coffee breaks and in the hallways, exhibits, etc.). 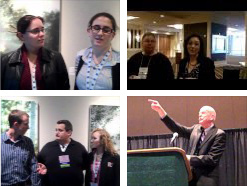 The audio recordings with powerpoint slides are now posted and publicly available at the AMS Meetings Web site.